Sleeping is important. When it comes to your growing list entrepreneurial ventures using sleep to keep your mind and body fueled will become ever important. Sleep keeps us alert, happy, motivated, and creative. These are all qualities needed to sustain the long hours, pivot gracefully and receive more opportunities in your life. Check out 5 ways to enhance your sleep schedule, so you can advance your wake time. Wake Up Earlier – There are several ways to do wake up earlier in the mornings. The first is to have a reason to wake up. Knowing what you want to do with your time will help convince you to wake up. 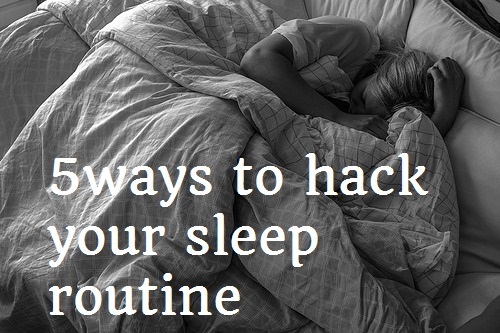 Also, it will give you a good routine to flow into right after turning off your alarm. Besides having a plan, one action to take is to set your alarm at your normal start time then set it ten minutes earlier each morning progressively. Take Naps – Taking naps is shown to have great effects on our productivity [link]. Many of my friends look at me incredulously when I say I take naps daily. How do I do it? I practice. Start in your nap spot and set your alarm for a 5-minute nap, then a 7 minute, then 10. Work your way up to a 20-minute nap and you will have the power nap [link] mastered. Sleep in Phases – Poly-phase sleeping is the practice of sleeping on a schedule of multiple smaller rests throughout the day over one long rest during the night. In essence, it’s your nap routine pumped to the max. I’ve not mastered this, but some people manage to get their sleep down to two hours a day. What a dream. Steve Pavlina explains this how to do this in detail. Meditate – I’ve heard 20 minutes of meditation is equal to 4 hours of rest. Try just one minute [link – YouTube video] to start. The increase in oxygen to your system will help it feel satisfied and mellowed, like the rest you can get from a well-maneuvered massage. Write Before Bed – Sometimes going to sleep can be difficult, especially for the entrepreneurial mind that often races with new ideas. One way to settle your mind is to take the time to write them all out before going to bed. A good sleep schedule is a great practice in personal leadership. Take the time to nurture your body and your body will nurture you. Hi Nzinga! Very interesting article. I need to check into that poly-phase sleeping. Hey Amy! Thanks for commenting.